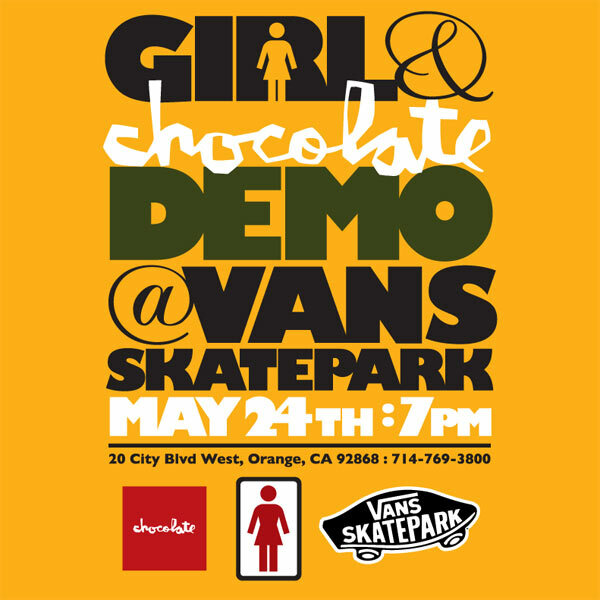 This Friday night Girl & Chocolate will be doing the demo thing at the Vans Park. In attendance will be Stevie Perez, Elijah Berle, Sean Malto, Eric Koston, Chris Roberts, Daniel Castillo, Justin Eldridge, Mike Carroll, Rick Howard, Jeron Wilson, Mike Mo, and Vincent Alvarez. A lot of guys will be at the 4:35 showing of The Hangover 3 in the mall, if you want to hit that up before hand too.